I made this modern baby quilt baby bedding in a rustic woodland theme with the stunning colors of gray, charcoal, and red. 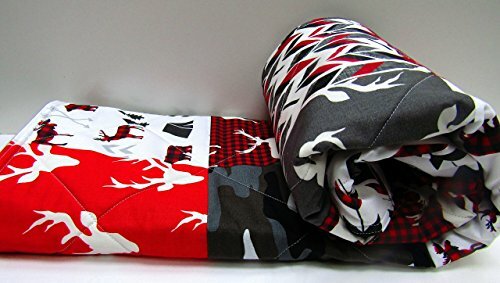 In this quilt you will find some plaid, camo, arrows, deer, buck, antlers, chevrons, and more. Baby size is 32 x 40 inches but I am offering 2 other sizes so be sure to use the drop down menu to order the size that suits you best. One is longer, better suited for crib covering and the other is longer and wider better for older babies/toddlers. I've constructed and quilted this quilt in a newer modern style sure to please new mothers! The batting used is mainly cotton with a small percentage of polyester to add needed durability. The quilt back is a very soft and medium gray flannel by Robert Kaufman, great quality flannel which really adds to the rustic charm in this quilt. If you prefer an off white backing please let me know. You will fall in love with the feel and weight of this quilt! These quilts make great and unique baby shower gifts. If you are interested in this quilt and do purchase it, you will know immediately upon receiving it that you have purchased a well made quilt of great quality. Be sure to scroll down to view all the baby quilts I offer. If you have any questions about this product by Now and Then Quilts, contact us by completing and submitting the form below. If you are looking for a specif part number, please include it with your message. By The Little Quilt Co.